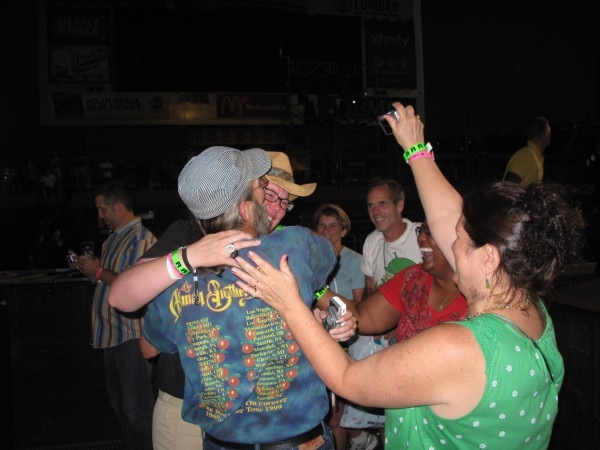 I had met Larry only once 10 years ago on the Elevation tour in Baltimore. 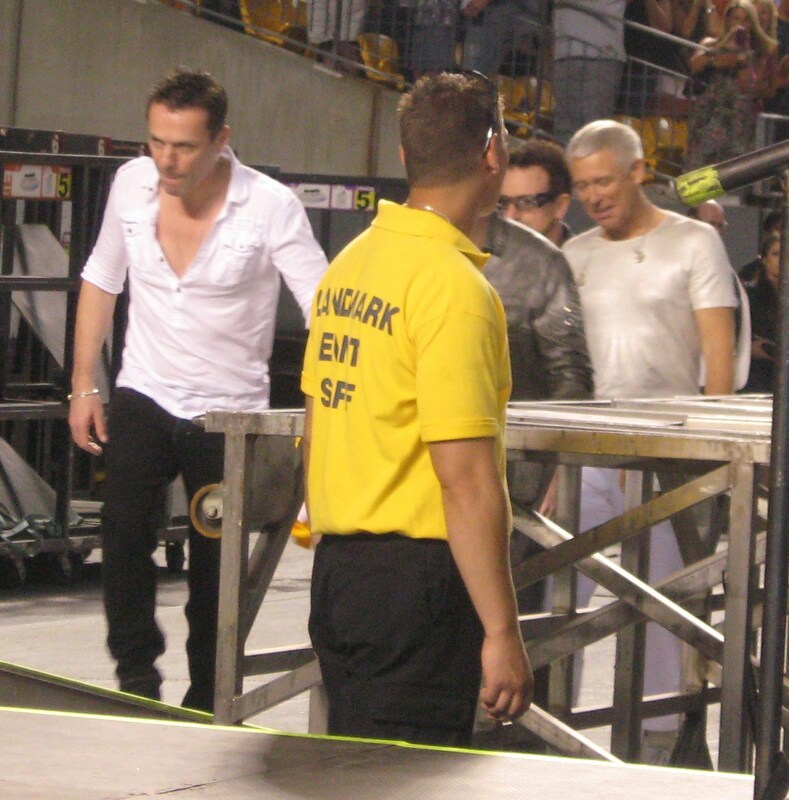 Larry, Bono, Edge and Adam all stopped on their way into the arena to greet the fans who were waiting. When Larry got to me, I said, ‘I don’t have anything for you sign, but can I have a hug?’ Larry hugged me, I cried and that was that. Although it was wonderful to be face to face with Larry and have him hug me, I wanted to actually speak with him and get a picture with him. I thought this 360 tour would be my chance since I was driving to all 16 US show, so I arrived at each stadium by 3pm to wait for U2 to arrive. I wore my black Larry Mullen Band shirt and straw cowboy hat to every show. 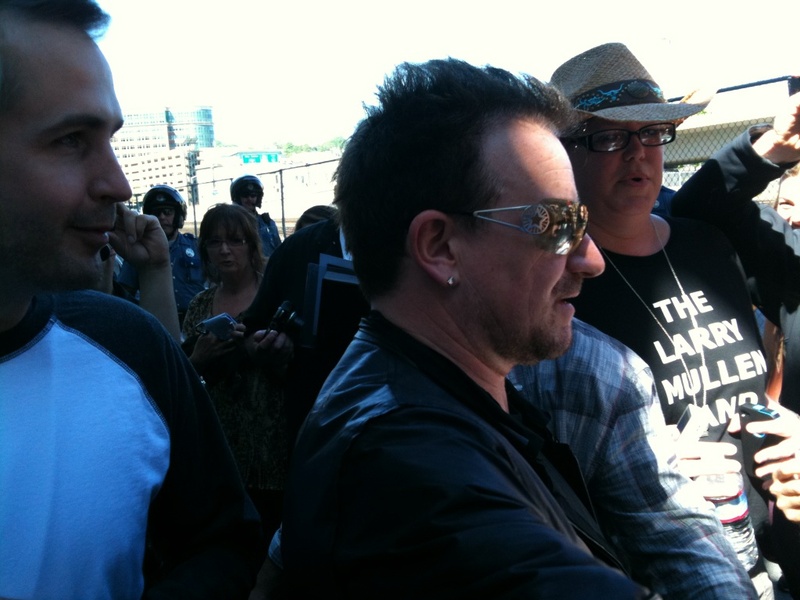 At the first show in Denver, Bono and Edge stopped and met with everyone but there were too many people around for me to get close. For the next show in Salt Lake City I didn’t wait for U2 to arrive because I came across the GA line first and started talking with people, so I just got in line at 4pm. 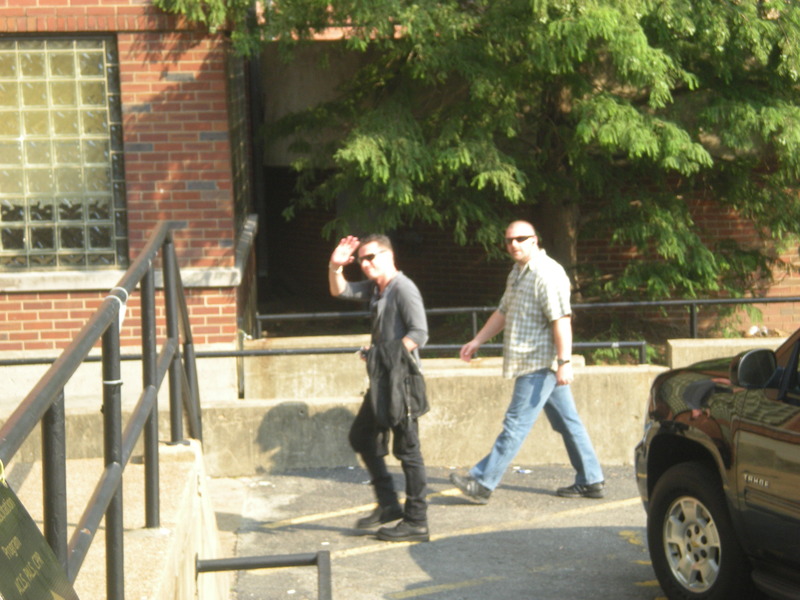 A week later at the final US show in Pittsburgh both Bono and Edge came out to greet the fans. I couldn’t get close enough to talk with them, but I did see Larry and Adam get out of their cars and walk inside. My friends Matt and Melissa talked with Bono and selflessly told him about me and how I’ve driven to every US show and would like to meet Larry. Brian, Bono’s security guy, told them to wait there and he would see what he could do. Brian came out later and told me Larry was in a meeting, but he told Larry about me and Bono told Larry about me. Maybe Bono and Larry knew he was talking about me, since I talked with Bono in Seattle and Oakland about meeting Larry and Larry sometimes waves to me as he walks to the stage – and Brian said he’s seen me at the shows. Brian took my phone number and said he would look for us inside. 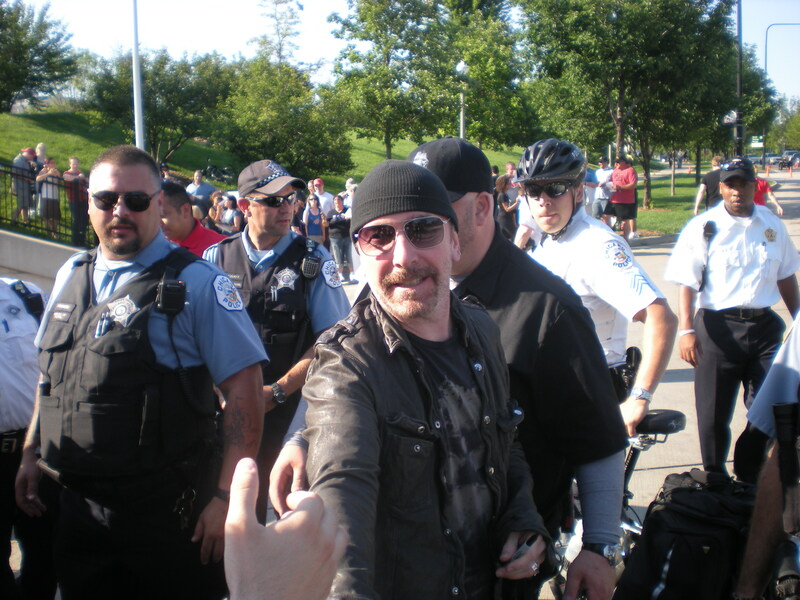 I waited on Edge’s side of the inner circle to wait for U2 to enter, as I always do. Brian came over and told me that he was still working on getting me to meet Larry. When U2 walked out of the tunnel (on Adam’s side) I noticed that Larry wasn’t first as usual. Adam and Edge were first and Larry and Bono were behind them, so I kind of thought something was up. But then somehow Larry moved up front. As Larry walked up the ramp, he locked eyes with me and was smiling. He walked across the platform and then down to me and hugged me. He didn’t say a word, he just put his arms around me. I think I muttered a ‘thank you.’ Larry gave me the biggest, best hug ever and then went on stage. I burst into tears. Everyone around me congratulated me and hugged me, which made the moment even more special. I was so excited that I don’t really remember Even Better Than the Real Thing or The Fly. I don’t think I came to until Mysterious Ways when Larry’s drum kit turned around and faced me behind the stage. I never thought Larry would walk over to me and hug me on his way to the stage before the show. 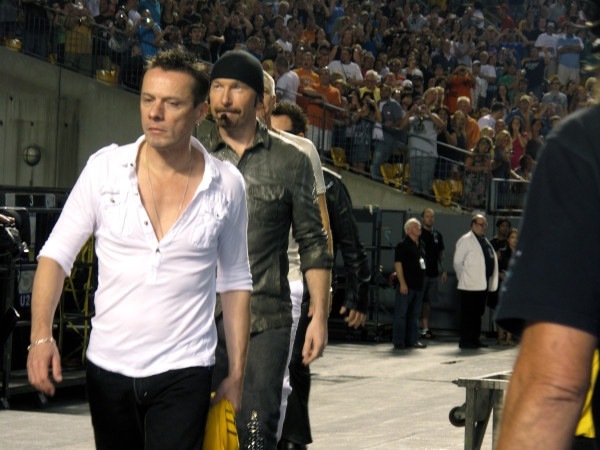 That was my favorite moment of the U2 360 tour and a perfect ending to my Musical Journey! 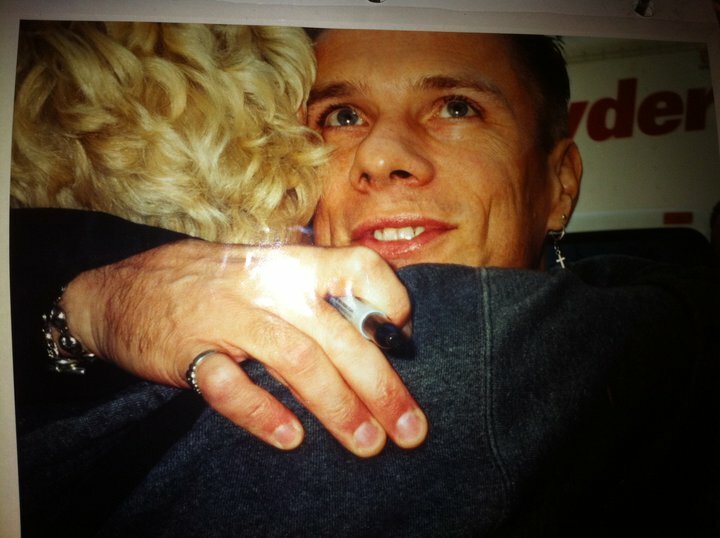 For all your U2 news, and updates on Larry Mullen, please follow me on Twitter @OnTheRoadWithU2.